Darcy Fitzwilliam is 29, beautiful, successful, and brilliant. She dates hedge funders and basketball stars and is never without her three cell phones—one for work, one for play, and one to throw at her assistant (just kidding). Darcy’s never fallen in love, never has time for anyone else’s drama, and never goes home for Christmas if she can help it. 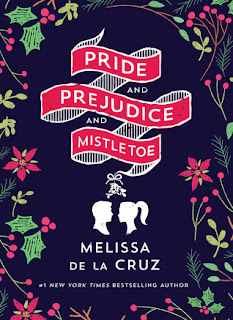 But when her mother falls ill, she comes home to Pemberley, Ohio, to spend the season with her dad and little brother. I simply cannot help myself - when I see anything related to ‘Pride and Prejudice’ - I rush in. On this occasion we have a modern day retelling of the classic but with its own unique twists - gender reversals for a start! The characters and storyline are bought to present day in this cutsie contemporary romance with just a slight sprinkling of the beloved tale of old. Despite my eagerness and willingness, this book just fell flat in it’s delivery on many levels. The writing for a start, is to be found wanting - from plot structure to sentence configuration. It lacked any emotional depth or deep character connections - they were petty, shallow and extremely judgemental. Now I can hear you say, but that is Darcy from the original - but this modern day female version was supposedly some high flying, self made New York millionaire - but what we got was an insolent, moody female who left a lot to be desired. The two just did not match up. And sadly, for me, Darcy never really changed or grew - she remained immature and self centred. The arrogance just became annoying. Which leads me to the book blurb - somewhat misleading if truth be told. Several things made mention of simply do not appear in the book e.g. basketball stars or three cell phones. The ‘Pride and Prejudice’ references are simply that, a small referral and not to be truthfully assigned as a retelling - Austen fans be warned. Overall, this is a quick and easy read, perfect for a weekend Christmas getaway. Whilst the concept was appealing it never really lived up to its potential. I've been hearing a lot about this one. I'm still on the fence about whether I want to read it or not. I'm sorry it did not work out. I thought the gender reversal was clever!